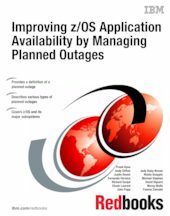 This IBM® Redbooks® publication is intended to make System Programmers, Operators, and Availability Managers aware of the enhancements to recent releases of IBM z/OS® and its major subsystems in the area of planned outage avoidance. It is a follow-on to, rather than a replacement for, z/OS Planned Outage Avoidance Checklist, SG24-7328. Its primary objective is to bring together in one place information that is already available, but widely dispersed. It also presents a different perspective on planned outage avoidance. Most businesses care about application availability rather than the availability of a specific system. Also, a planned outage is not necessarily a bad thing, if it does not affect application availability. In fact, running for too long without an IPL or subsystem restart might have a negative impact on application availability because it impacts your ability to apply preventive service. Therefore, this book places more focus on decoupling the ability to make changes and updates to your system from IPLing or restarting your systems.